If users search the partner portal and didn't find what they were looking for, they can share an integration idea. What is the partner integration idea process? Users share an integration idea and Instructure reaches out to the tool provider to inform them of the interest from the Community. Technical documentation and guidance needed to build an integration are provided. 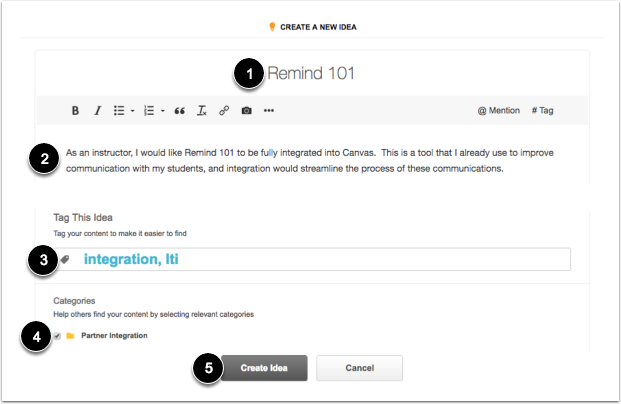 Ultimately, the tool provider must decide to build the integration and make it available to Canvas users. Regular communication with the tool provider allows everyone to know updates to the status of the idea, so be sure to follow the Partner Integration ideas page, along with specific ideas to track. How do I share an integration idea? First, search existing integration ideas. If there is not a similar idea, share a new integration idea. What role (teacher, student, admin) would use this integration? How would the integration be used? Why is the integration important? What contacts are available for the tool provider? To complete the submission, click the Create Idea button . Integration ideas that are open for community voting. If there is an idea for a tool to integrate with Canvas, give it the thumbs up. The more votes the more likely a company will be to invest in the development of an integration. Development work has started and an integration with Canvas is underway. The integration is complete. Find more information and installation details in the Edu App Center. Previous Topic:What is the feature development process for Canvas? Next Topic:What tags should I use for Feature Ideas in the Canvas Community? Table of Contents > Feature Idea > What is the partner integration idea process in the Canvas Community? Re: Is there a way to import Open-Up Resources units into Canvas?